Despite the growing hype around electronic commerce, there's a real technology behind the buzzword -- the Object Management Group's standards, including CORBA, IIOP, UML and XMI, have made dis- tributed object tech- nology and component-based development a reality. Fingar, Kumar and Sharma do a great job outlining the business drivers, technologies, processes and pitfalls a real enterprise faces in making the transition to doing business on the Web. portends. My advice for the Internet generation of business and technology leaders is -- Just read it! This is the best- researched book I've seen on enterprise- class electronic commerce, especially because it em- phasizes the crucial need for industry-wide cooperation through efforts such as CommerceNet's eCo project. Peter, Harsha and Tarun do an excellent job of char- acterising the essential changes in dynamics that must occur between and within companies as we struggle together to move into the new era of electronic commerce. 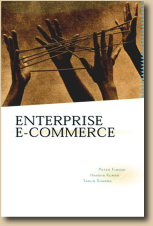 Enterprise E-Commerce is the new book for the new millennium. Unique among the books published on electronic commerce, this book is a thoroughly researched guide for Global 2,000 companies to chart their course to the digital economy. It takes head-on the challenges and issues of enterprise-class electronic commerce -- a completely new infrastructure for a whole new way of doing business. It addresses the requirements of large-scale, mission-critical applications where agility, scalability, reliability, extensibility, interoperability and integration with heterogeneous legacy systems are essential. Because e-Commerce is inseparably about both business and technology, the book takes a holistic view to fuse these two worlds into one, and reflecting the authors' passion, takes on the challenge of reaching both business and technical people. It provides CEOs and line-of-business managers with blueprints for building agile companies that can thrive when nothing is permanent but change. For CIOs, CTOs and e-Commerce development teams, it describes the technology architectures needed to embrace change and enable the digital corporation. Along the way it maps the emerging standards for open e-Commerce and open markets including CommerceNet's eCo framework, Enerprise JavaBeans, XML vocabularies, CORBA, Oasis registries, UML and the OMG EC reference architecture. The e-Commerce imperatives described in the book's opening chapter sound the clarion call for action. Then, a full chapter is devoted to the third wave of e-Commerce where inter-enterprise process engineering (IPE) and software components provide the breakthrough for sustaining multiple e-Commerce initiatives. Complete stand-alone chapters are devoted to each of the four major sell-side and buy-side application categories of electronic commerce: I-Markets, Customer Care, Vendor Management Systems and Extended Supply Chain Management. Each of these chapters explains the business case, the inter-enterprise business processes and software requirements. Another full chapter, Component-Based Development for E-Commerce, moves on from the 'what' to the 'how.' Teaching by example, the chapter uses a fictitous company to present a case study with specific methods and techniques to develop an e-Commerce application using component assembly and repositories of business models, design artifacts and use cases. The book's 26 page index is a veritable lexicon for e-Commerce and the digital era. Its comprehensive bibliography is a single reference to the entire body of knowledge on the business and technology of e-Commerce. Its concluding chapter reflects the breakthrough strategies corporations need in the brave new world of e-Commerce. The book teaches, inspires action and shares insight from the authors' pioneering work with Fortune 1000 companies including GE, MasterCard and American Express. It�s the one reference business and technology practitioners need to map the road ahead -- and then act! Peter Fingar is one of the industry's noted experts in component-based electronic commerce and an internationally recognized author. He is Technology Advocate for EC Cubed where he provides leadership, technology direction and liaison with industry standards organizations, and strategic technology and business partners. He has held technical and management positions with GTE Data Services, the Arabian American Oil Company, American Software and Computer Services, and Perot Systems' Technical Resource Connection. He served as Director of Information Technology for the University of Tampa and as an object technology consultant for IBM Global Services. Peter has written six books on computing, presented conference papers worldwide, and published numerous professional articles in CIO Magazine, Component Strategies, Object Magazine, Sun World Online and Datamation. He taught graduate and undergraduate university computing studies in the United States and Saudi Arabia. As a practitioner, his systems development experience was gained in diverse industries and spans technology generations from unit-record to Web Object Computing. He has played an active role in promoting the commercial applications of object-oriented and intelligent agent technology for competitive advantage. Peter is a long standing member of the IEEE Computer Society and the Association of Computing Machinery (ACM), and assists the Object Management Group with its representation in the Middle East. Harsha Kumar is co-founder of EC Cubed and serves as the Director, Product Strategy. His current responsibilities include driving technology strategy and alliances, as well as product roadmap for EC Cubed. He is a frequent speaker at professional conferences relating to e-Commerce technology. Harsha was responsible for crystallizing EC Cubed's vision of "application components" into the ecWorksTM suite by driving and leading the product specification, design and development functions. Mr. Kumar also worked with clients on their e-Commerce strategies and implementations, including GE Capital Vendor Financial Services, TransAmerica Leasing and the Gartner Group. He plays an advisory role in the CommerceNet Catalog Inter-Operability Pilot project. While at GE Capital, Mr. Kumar was a Lead Architect on the industry's first B-to-G.com, "SourceOnline." He has worked in several R&D organizations including Bellcore and the HCI Lab at the University of Maryland. While at Bellcore, Mr. Kumar developed supply chain applications for inventory planning and replenishment for the Bell companies. His work with Prof. Ben Shneiderman on hierarchical visualizations has been published in international journals. Mr. Kumar received a Bachelor of Technology degree from the Indian Institute of Technology, New Delhi, and an MS in Systems Engineering from the University of Maryland. Tarun Sharma is co-founder of EC Cubed and serves as Director, Product Management. His current responsibilities include technology alliances and evangelism of component-based computing architectures for e-Commerce. Mr. Sharma is an authority on component technologies and has been published widely in professional magazines. He has co-authored another book, Programming Web Components, published by McGraw-Hill (1997). Tarun is a popular speaker at professional conferences on e-Commerce and related technologies. He also represents EC Cubed at the Object Management Group. At EC Cubed, he has led client projects ranging from strategy, to implementation and rollout for several large-scale business-to-business initiatives. These include GE's TPN Register content aggregation portal, MasterCard's Commercial Card Gateway and American Express' @Work customer self-service portal. Prior to EC Cubed, Tarun developed portions of GE Capital's "SourceOnline," the industry's first B-to-G.com. While at ICL, Tarun developed financial applications for companies including the National Commercial Bank (Jamaica) and the Caribbean Development Bank (Barbados). Earlier, he taught Computer Science courses at NIIT and worked as a researcher on Artificial Intelligence-based Natural Language Processing at C-DAC, Pune, India. Mr. Sharma received his Bachelor of Engineering degree in Computer Science from the Pune Institute of Computer Technology.